Have you ever read some sewing instructions that read something like this? When I found the pattern to my corn dress I was pleased that it came with a purse pattern. A nice little quick project that only had three steps. 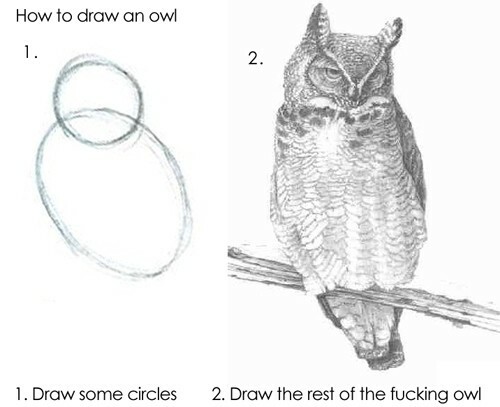 Step two was make the rest of the owl. After I took longer than I would like to admit trying to figure out step two, I got it. I would love to show you these three steps but as you will see from the gif my sewing room is a MESS and I can't find it. The purse still seemed like a quick project so I figured I could make a quick little gif out of it. 50 photos later(with big ups to Steve Sleeves) here it is!